I. The crew of the Nale Tasih 2 immediately before departure from Kupang harbour, Timor, 17 December 1998. 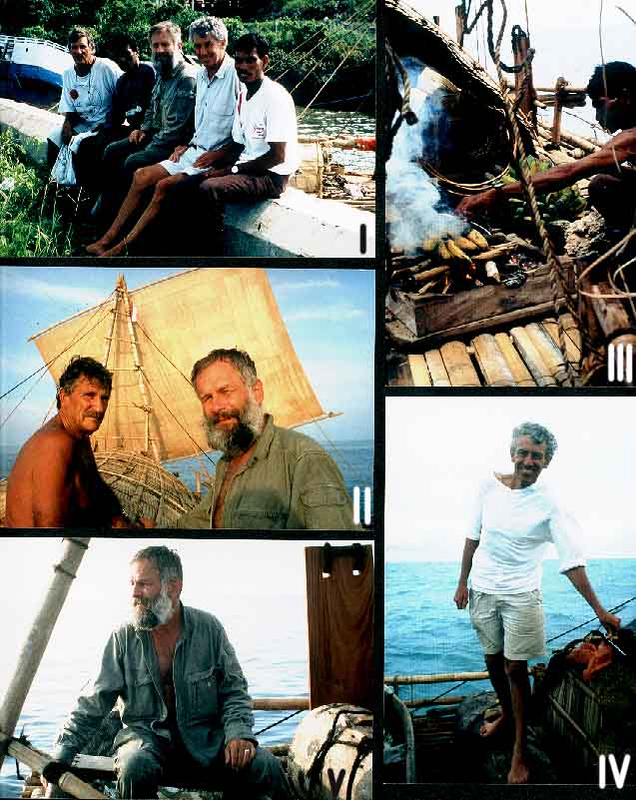 From left captain Bob Hobman, traditional boat builder Emmanuel F. Littik (Om Ife), scientist Robert G. Bednarik, cameraman Peter Rogers, harpooneer Jacobus Zakawerus (Om Mberu). II. Hobman and Bednarik on the Nale Tasih 2, Timor Sea. III. Om Mberu preparing food on the fire box. IV. Rogers standing on a tree trunk hollowed out by termites which contains the expedition’s fresh water supply. V. Bednarik on the steering oar of the Nale Tasih. I. Om Mberu’s harpoon pointed at a large dorado fish. II. Seconds later, the harpoon has found its mark. III. The 1.6-m long dorado is hauled on board by Om Ife, still alive and fighting. IV. After a struggle the warm-blooded fish is bludgeoned to death with a club. V. Large sea turtle attempting to board the Nale Tasih. I – Om Mberu roasts a tuna he has harpooned. II – Om Ife and Hobman repair the mast rigging made of forest vines. III – The sail has been shredded by the storm. IV – The replacement sail is rigged up. V – The replacement sail is raised. 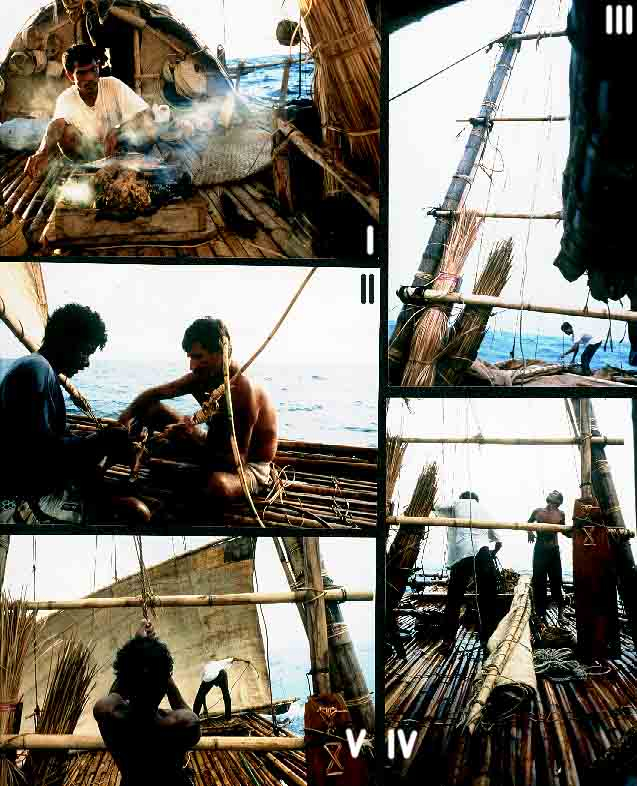 Sailing across the Timor Sea, as Middle Palaeolithic sailors might have done this 60 000 years ago to reach Australia. Conditions encountered ranged from calm seas to cyclonic monsoon conditions with 5-m waves in a raging sea. On the lower right, the bow of the Nale Tasih 2 juts out 6 or 7 m above the sea as it thunders towards the Australian coast. Its yard arm was smashed, its sail torn to shreds, the steering oar shattered, and all four forward guy ropes, consisting of forest vines, snapped in unison at this stage of the journey. I – Manufacture of a harpoon with a bone point modelled on Middle Palaeolithic specimens and made entirely with stone tools. II – Working bamboo with a Palaeolithic stone chopper which was also used in felling the stalk. III – Om Mberu and Om Ife are gutting a freshly caught fish with stone tools on the Nale Tasih 2. IV – Preparation of wild millet by boiling it in a bucket made of a lontar palm leaf. V – Fire drill used in lighting fires on this expedition. I – Heavily burnt fragment of large sea shell found with Stegodont remains in Pleistocene deposit of To’os, West Timor. II – Bednarik with fragment of Stegodont molar he just found at Motaoan, West Timor. III – The first Lower Palaeolithic stone tool found in Timor, still in situ at the site Motaoan, West Timor. IV – Moment of recovery of 840 000-year-old stone tool at Boa Leza, Flores, from solidly cemented mudstone. V – Excavation of hominin occupation site at Boa Leza, Flores, showing two molars and mandible of Stegodont as excavated from solid rock.